One of Indah’s more popular designs now in a gorgeous hand-painted print. 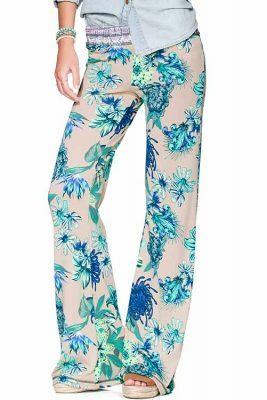 Indah‘s Tropical Stripe Eclipse Pant. Mid-waist wrap design. Long, flowing leg panels as well as surplice openings in front of thighs. Comfortable elastic waist. Also, fabric belt tie provides a custom fit. Hand painted, lightweight 100% viscose is super soft against skin. Wear together with: Shipwreck Halter Top. Also available: Tropical Stripe Palm Wrap Short.